The challenge of addressing health inequalities is core to improving population health and delivering the 5 Year Forward View. In 2010, Sir Michael Marmot published the report “Fair Society, Healthy Lives” which set out the scale of health inequalities in England and the scale of preventable mortality caused by these health inequalities. The Marmot report clearly set out the social gradient in health and the links between the social determinants of health and an individual’s access to good health outcomes. It is unacceptable that people living in the least deprived areas of England live around 20 years longer in good health than those living in the most deprived areas. Reducing health inequalities means giving everyone the same opportunities to lead a healthy life, no matter where they live or who they are. Public Health England East Midlands has published the attached report, ‘Health inequalities in the East Midlands: An evidence report’ . The report shows that on average men and women living in the East Midlands have a life expectancy and a healthy life expectancy that is lower than the average for England. The data that has been used within this report illustrates that across the East Midlands there has been no reduction in health inequalities since the publication of the Marmot Report and in some of the data presented in the report we can see that these gaps are getting wider. This report looks in detail at the variation in health inequalities across the East Midlands and the factors that are driving these inequalities in health outcomes. This report emphasises the importance of prevention in increasing healthy life expectancy in the East Midlands population by reducing exposure to risk factors that lead to ill health. As well as improving population health, this will reduce pressures on health and social care services. By understanding the variation in health outcomes we can start to work together to understand and systematically address health inequalities. This report provides us with a baseline to work with across the East Midlands and as such is a useful foundation for us to work together more systematically towards improving health and wellbeing for our population. The LGA has been working with DH, NHS Employers, Skills for Care and others to identify key workforce challenges and potential solutions in health and care integration. As an outcome, a presentation has been developed to aid local research and discussions. This can be here. 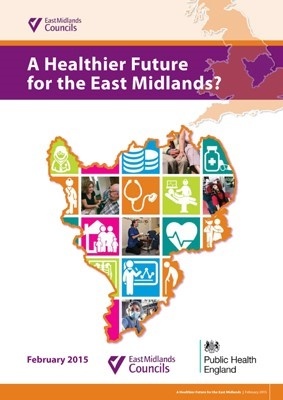 This document sets out PHE East Midlands proposals for service delivery and offer of support across the East Midlands and covers the work of their teams in Health Protection, Health Improvement, Healthcare Public Health, Workforce Development and Public Health Information and Intelligence. Public Health England East Midlands delivery is supported by an integrated business support team. The prospectus has been developed through engagement with a range of local partners and describes the current work plan and PHE East Midlands achievements from last year. The prospectus covers the range of services PHE East Midlands provides and our commitments for the coming year. An overview of the main roles of PHE Centres and PHE Regions available here. The East Midlands Health Review is intended to complement the work already undertaken by health and wellbeing boards and local health scrutiny committees through ‘adding value’ and support in addressing the joint priorities of councils, MPs and key health partners. MPs, councillors and health professionals held a summit meeting at Westminster on Thursday 30th October 2014 to discuss the effectiveness of health services across the East Midlands, as part of a 'Health Review' led by East Midlands Councils. The Health and Well-Being Board (HWB) Chairs' Network supports HWB Chairs to develop their their role through exchange of information, practice and ideas. The Network consists of the 10 HWB Chairs in the East Midlands (Derby, Derbyshire, Leicester, Leicestershire, Lincolnshire, Milton Keynes, Northamptonshire, Nottingham, Nottinghamshire, and Rutland).